I’m a little surprised at how far behind Shanghai has lagged in opening a cronut (I’m sorry, a Cronut™) shop. In New York, the birthplace of the croissant/donut hybrid, cronuts are old news: the inventor of last summer’s trendy dessert has already moved on to pushing his other creations, like an ice-cream sundae in a can and a “pretzel lobster tail.” The gourmet treat has been imitated by outlets further down the food chain, and even Jack In The Box is now selling a cronut-inspired snack item. Singapore and Tokyo have had knock-off cronut shops for ages already. 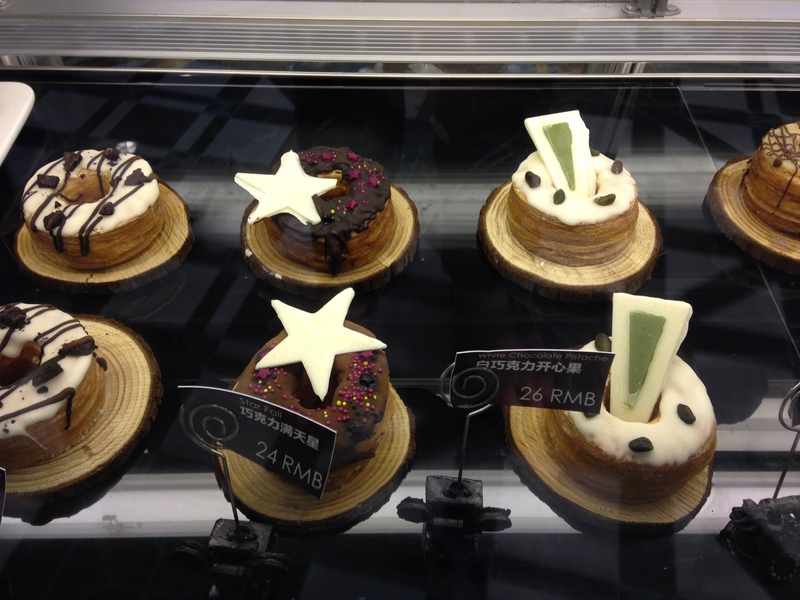 But Shanghai has languished, cronut-less … until now. I first saw the sign back in early June when exiting the subway station in Xintiandi, an upscale shopping district several neighborhoods to the east of mine. 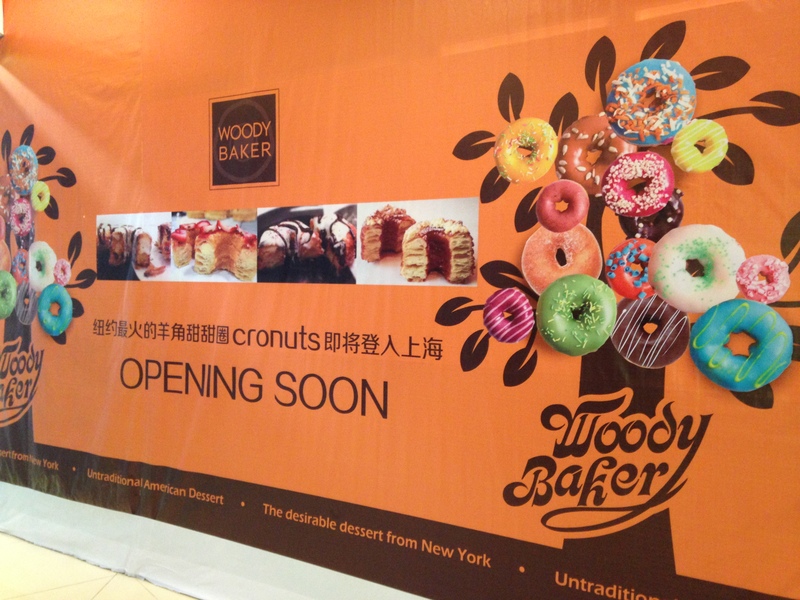 “Opening Soon: Woody Baker,” which promised to deliver “The desirable dessert from New York” to Shanghai’s masses. Every time I went through the station, however, Woody Baker was still “opening soon.” Woody clearly wasn’t worried that no one would care about cronuts by the time he opened for business. But as I left the Xintiandi subway station on my way to lunch at SproutWorks today, I realized that the construction barrier that had stood in front of Woody Baker was finally gone, revealing a small storefront with a display case full of cronuts. I decided that after a healthy lunch, I would come back to see if cronuts lived up to the hype. I don’t know if it’s still the case, a year after they made headlines, but the original trademarked cronuts at New York’s Dominique Ansel Bakery were famously hard to get when they first debuted. The bakery makes only a couple hundred each day, and people lined up for hours to buy one. The official Cronut™ website still advises that “As a rule of thumb, if you arrive prior to 7:00am on a week day, you have a great chance of getting the Cronut™ pastry. (Weekends tend to be busier. )” Fortunately, the queue at Woody Baker was only three or four people long when I arrived around 1pm. The main consumers of cronuts are definitely women: of the 10-12 people who bought cronuts during the half hour I was at Woody Baker, only one was a man (and he got the pastry to go, so maybe he was buying it for someone else). The other women and I crowded around the display case, all of us simultaneously checking out the cronuts and taking photos of them. Woody Baker has about a dozen flavors on offer, including typical ones like original custard and chocolate almond to more localized tastes like green tea and fresh blueberry (the latter looked like it would be a mess to eat, with a ring of gloppy blueberry sauce running around the top of the cronut). Prices range from 18 to 26RMB ($2.93-4.23)—a little bit under the $5 per cronut price tag at the Dominique Ansel Bakery, and actually about 10-15RMB less than I expected to pay, given that a single scoop of gourmet ice cream or gelato here will set you back 30RMB at a minimum. Yes, the cronut is a modest splurge, but all of the customers at Woody Baker today were fashionably dressed young women (I was definitely at the high end of the age range and the low end of the fashion one), and those are the customers in Shanghai who won’t mind opening their wallets for something new and trendy. I ordered my cronut (coco cream) and took a seat to wait for it. And wait. The cronuts in the display care are just for show; fresh ones are made to order for each customer, which takes at least five minutes if there’s no one in line and more like 10 as soon as more than one order is placed. I wasn’t in a hurry or anything, but didn’t realize that crafting cronuts takes so much time. After 10-15 minutes, my cronut arrived. So how was the famed cronut? It was good. It was messy—the waitress served it with a little fork, but the shell was too crispy and flaky to make that work, so I just picked up the cronut and ate it with my hands. I hadn’t realized that it would be split open and filled with pastry cream, but that wasn’t a bad surprise. The whipped cream-like frosting on top was very light and still cold, which contrasted nicely with the pastry layers, still warm from the fryer. I saw a tutorial last year on how to make “cronuts” at home using Pillsbury Grands biscuits as a base, and the pastry in Woody Baker’s cronuts definitely reminded me of those—flaky layers oozing with just a touch too much oil. It was fine. It was different. It was something I probably would not eat again, and certainly wouldn’t wait in a long line for. I wouldn’t say I understand what all the hype is about, but I know that hype is usually not about how good something is, but how desirable it’s made out to be—and the Dominique Ansel Bakery could give a master class in drumming up hype. 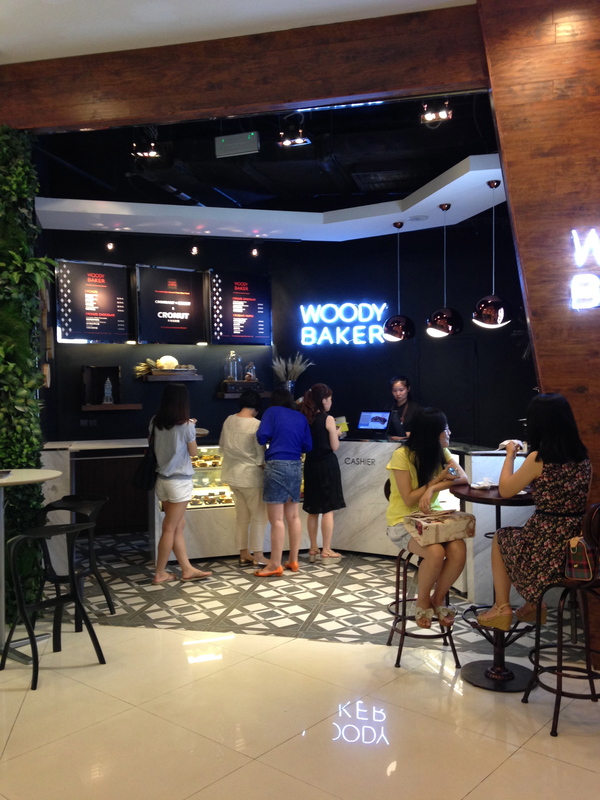 I don’t know how long Woody Baker will manage to stay in the cronut business, but I’m sure the young ladies of Shanghai will keep him going for at least a couple of months. 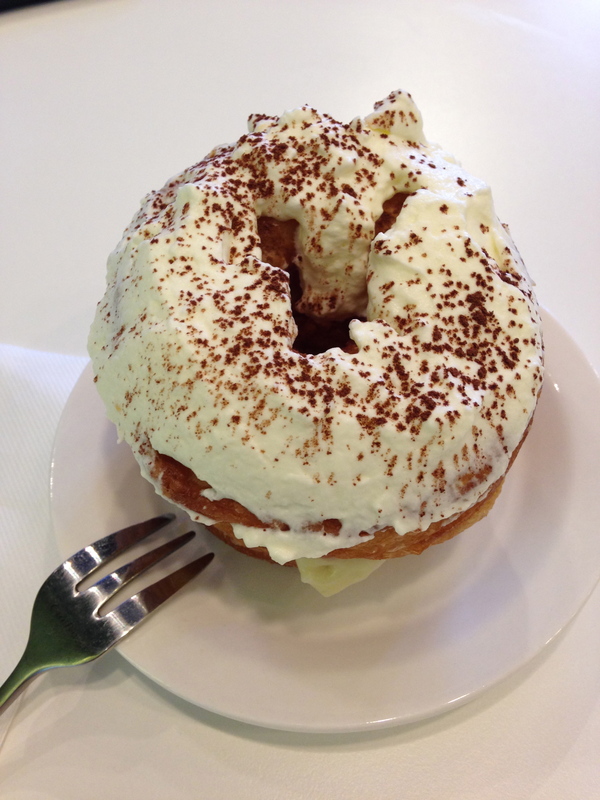 So yeah: cronuts … eh, they’re just okay. But when the ice cream sundae in a can finally makes it to Shanghai, let me know. Previous Previous post: So, What’s Next? Where in the Xintiandi stop is Woody Baker? It’s exit 6, I believe—the direct entrance to the Xintiandi Style mall from the subway station. There’s a set of escalators that goes up to the first level of the mall, and at the base of the escalators is Woody Baker (if it’s still there! They were not doing much business the last time I went past in November). Hope you enjoy your cronut!